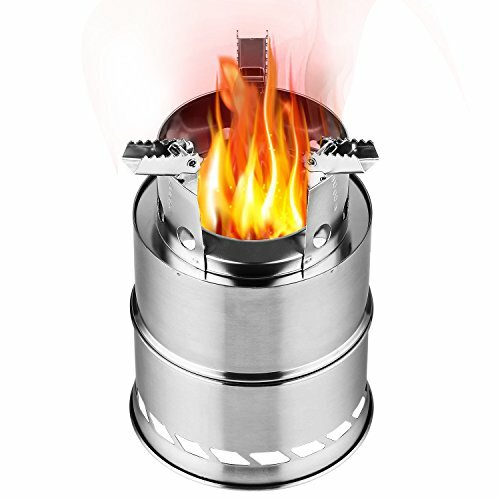 This REDCAMP alcohol stove is perfect for backpacking,hiking,camping,hiking or other outdoor activities,with a storage bag,easy to carry and can be easily used directly for combustion,it can used the solid alcohol and liquid alcohol,but the vaporization effect is not as good as the liquid,we recommend to use the liquid alcohol more than 95% purity. Material: Aluminum Alloy base+Copper burner. COMPACT AND LIGHTWEIGHT: Crafted with high quality stainless steel which can stand high temperature and weight,durable and lightweight.Unfolded size is 5.1"x5.1"x7.9",can be easily put into a 5.5"x5.5"x3.1" storage bag,only 17.3oz. EXCELLENT STABILITY: This camping wood stove geared with 3-arm base support system,provide safe and stable cooking platform. A double wall design, unique airflow properties makes it extremely efficient and the fuel to burn more steady. Eco-friendly: Uses twigs,leaves,wood,dry firewood, wood chips,charcoal as fuel.Leaving no chemical emissions behind,no need to carry heavy, polluting and expensive canister fuels. EASY TO INSTALL: The supplied separate 4 parts can be easily to install and disassemble,very compact. A really nice piece gear to have for travel, camping, emergency and any other outdoor activities. 100% MONEY BACK GUARANTEE: REDCAMP offers a 365-day limited manufacturer warranty. If you're not satisfied for any reason, please contact us immediately and we will give you a reply within 24 hours.